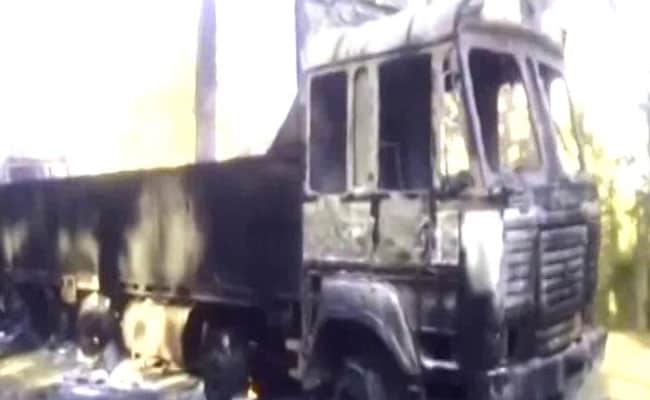 Naxals and their supporters attacked the facility of a local mining company and set the trucks afire. Mumbai: At least 75 trucks ferrying iron ore from Surajgarh in the Gadchiroli district of eastern Maharashtra were burn down yesterday by suspected Naxals, the police have said. The incident took place when 400 to 500 Naxals and their supporters attacked the facility of a local mining company and set the trucks and three earthmovers afire. Reports suggests that workers of the mining company were also held hostage for more than three hours by Naxals. No arrests have been made so far. The police have been cautious in approaching the area as it falls in the heart of Naxal-infested territory. Local tribal people are opposed to mining in the area and have been protesting against the government leasing out large tracts of land to mining companies. With the support of locals, Naxals had managed to stall all mining activity in the area but earlier this year the government granted fresh leases to private companies to carry out mining operations.